Ladies, I guess I have to admit I am a thrifting, sale junky! Nothing gets my blood pumping like a clearance sale or 50% off at GW. My thrifting has been put on the back burner due to craziness in the work place. I miss it tremendously. I think it's time to get my mojo back! If any of you have read my recent posts you know that my company has gone through a buy out. For the last several months I didn't know if I was going to keep my job of 13 years. Yesterday I was told by one of the "big" bosses that I will stay. He said they really like my performance! Yay! At almost 54 this has been a hard transition. I'm seeing the light at the end of the tunnel. My minimum work day is still 10 hours but I'm seeing happiness in the future!!! Sooooooooooo, back to thrifting. It's kinda a passion with me. I have a pretty huge closet (thanks to my brother) and it's over flowing with stuff. None the less I can put an outfit together in my sleep. Do I sound cocky? Over confident? No way, no how. That's just a fact Jack! Even as I write this I am wearing my Kokapelli T over black tleggings and you can bet my feet are slathered in vaseline under my socks! It's not easy getting old. Of course we all search for the miracle creams and serums. I really don't believe they exist. My way of thinking is slather the moisturizer on and keep your PHD at the correct level. I actually use apple cider vinegar 50/50 with water to rinse my face at night. I Just Saturate a cotton ball and wipe it on. It seems to be working so how can I complain! I just can't help it I love home remedies. 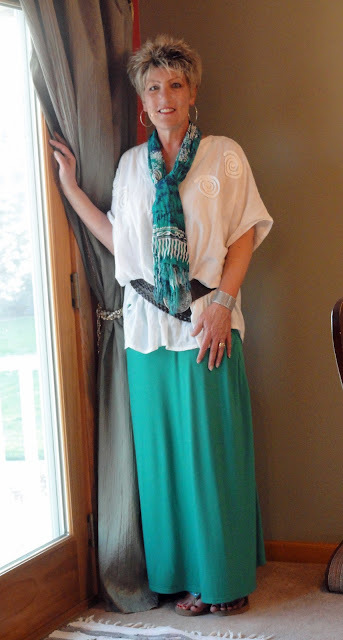 Tonight I am probably rambling (that would be due to wine) but I wanted to share my spring fling maxi! Dont' forget my own link up Trending through the decades: Pastels is still up and running. So get your pastels out of the closet and stop by! Linking up with Thursday's are for thrifters click on over. Dawn is a fun and spunky young lady! Also linking up with The Pleated Poppy for What I Wore Wednesday. Tammy! I LOVE this outfit!! A bit of a bohemian vibe, yet very chic. You don a scarf like no other. You are just stunning. I will be SOOOOOO glad when it's flip flop/sandal weather here. Knowing you have some job security has got to be a major relief. I'm going to try your vinegar rinse tonight! I love this look! Beautiful spring colors! and in this day and age JOB SECURITY is one of the best things you can have! You look fabulous in turquoise! I love the subtle pattern in the top. So pretty. I am so glad that things are going better at your office. Being miserable at work everyday is no picnic. Been there, done that, don't want to do it again. I do love this outfit. You have such an regal elegance even in casual clothes. I love those 50% off signs too! Haha, your posts are great when you've had a drink. Keep the rambling coming! Thanks for linking up with Thursdays are for Thrifters! yay...so glad to hear about your job. And lady..you look stunning as usual. I like the green skirt. and the matching scarf is great! What a lovely look...I really need to check out my thrift shops! I tend to stick to my own fave vintage boutique. I love love this outfit sooooo much! Relaxed and chic...and the color's just gorgeous! You look fantastic in pastels!! wow! I really love this outfit on you! Just beautiful. And congrats on being one of the workers who gets to stay! Yay! Hope the hours start to ease up for you. This is stunning!! Love everything about it! OOh, I love this beautiful shade of greeny-blue! !